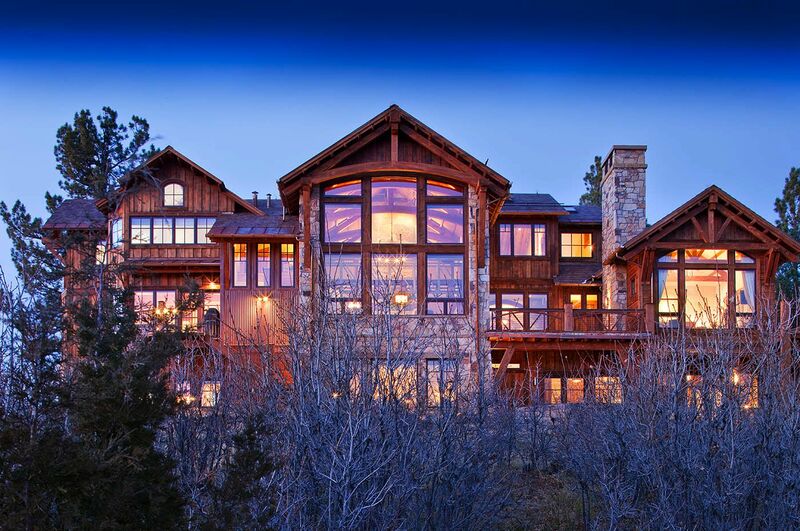 Placed upon a sunlit grassy knoll facing Colorado’s San Juan, and San Miguel mountain ranges, with Utah’s La Salle Mountains to the south, North Star Ranch overlooks an Aspen painted valley with touches of Ponderosa and Scrub Oak accents. The core of the structure was designed with large facades of glazing facing the southern views while the garage was rotated 45 degrees to work with the existing grades as well as minimize the impact of the garage pod as one approaches the home. 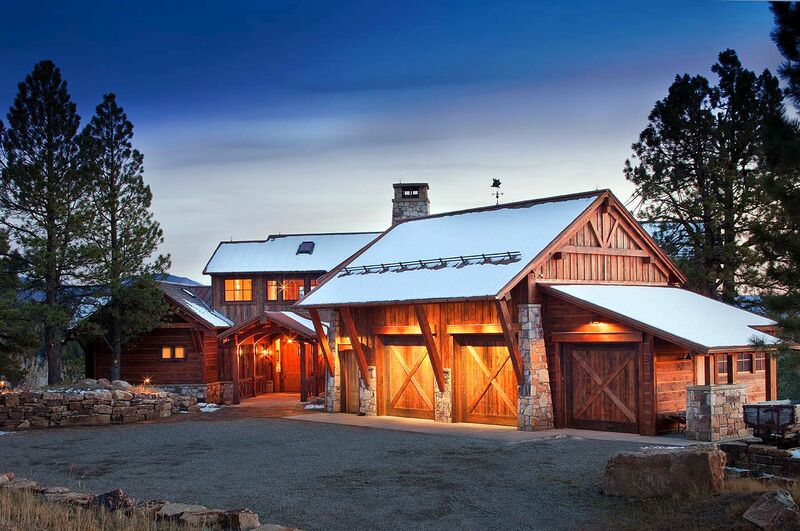 The home was thoughtfully sited to nestle next to a several large existing Ponderosa Pines creating an intimate mountain setting. Sustainable measures were discussed and implemented early during the design and construction process such as utilizing indigenous stone harvested from site for retaining walls and portions of the home’s veneer. Reclaimed materials were considered and implemented wherever possible, ranging from historic wood directly from “The Wizard of Oz” production set to miscellaneous parts from old mining carts historic to the area. The historic wood was given a patch work effect combining horizontal planks with a reverse vertical board and batten with a mixture rusted metal accents on certain walls to introduce a visual exception from the consistency of the wood. Wood and steel structural members such as timber trusses, knee braces, purlins, beams and columns are exposed throughout the exterior and interior as a way of celebrating the structure and telling the story of how the home is constructed. As guests arrive, they are welcomed by an entry bridge constructed from a single solid stone slab 2 1/2 feet thick spanning over a calm flowing stream. The bridge is covered by an articulated gable element supported by ornate columns and connections tying directly to the stone slab. The layout of the interior is divided into separate living corridors; a master core witch houses the master suite, office, sitting room and exercise room with a separate stair connecting to all three levels. The centrally located kitchen was designed with several working and entertaining stations defined by multiple islands and a floor to ceiling wall of glass in lieu of wall lined cabinets to allow for maximum natural light in the major public areas. The core living spaces are linked via an internal trestle bridge designed on location and constructed from old mine carts as the walking surface and the reclaimed steel wheels as a structural detail. The rest of the home is detailed throughout with ornamental ironwork, granites, tiles, etc. all enhancing the modern like aesthetic with an historic mining influence.